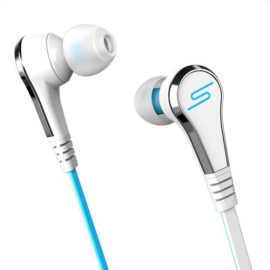 STREET by 50 In-Ear Wired Headphones, designed in collaboration with international recording artist, entrepreneur, and philanthropist, 50 Cent, are professionally tuned and ergonomically designed. All SMS in-ear headphones produce crystal-clear sound and pure comfort and feature reinforced cables so that they're built tough enough so you can enjoy them anywhere the music takes you. Bring your music with you anywhere you go whether it’s the gym, the ball park or your morning commute, enjoy it the way it was intended to be heard. Featuring a professionally tuned 11mm driver, a flat non-tangle cord and an Apple control mic with volume control, they have been ergonomically designed for crystal clear sound and pure comfort, the STREET by 50 earphones are designed for the ultimate portable audio experience. In addition to the professionally tuned 11mm driver, STREET by 50 earphones feature an ergonomically designed Apple control mic with volume control. Access music and call features on your favourite Apple products, including play, pause, track forward and back, and volume and call answer features. The tough, tangle-free flat 2-colour cord is ideal for listening to music on the move. Gold-plated connectors for 3.5mm jacks improve conductivity and durability. With Professional studio quality sound, high-end styling, the design complements any music playing device and the STREET by 50 In-Ear Headphones are suitable for any genre of music, to fit and enhance various lifestyles. Each STREET by 50 In-Ear Headphones comes with 6 silicone passive noise cancelling tips; carry case and an owner's manual.